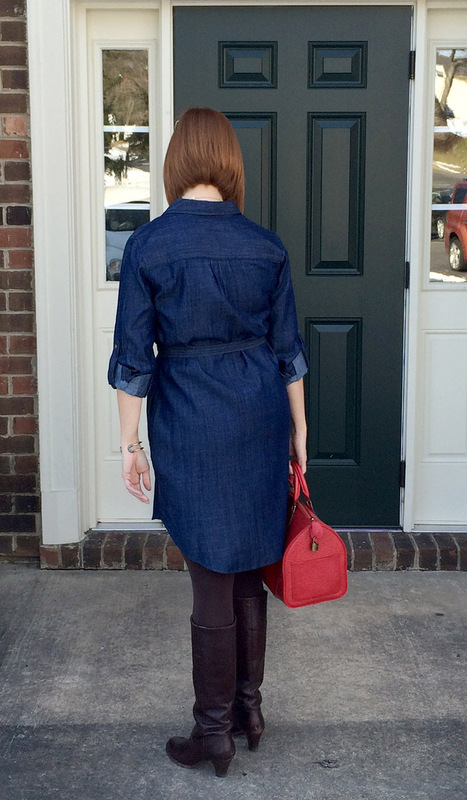 Looks Good from the Back: Adrien: Review: Banana Republic Chambray Shirtdress. 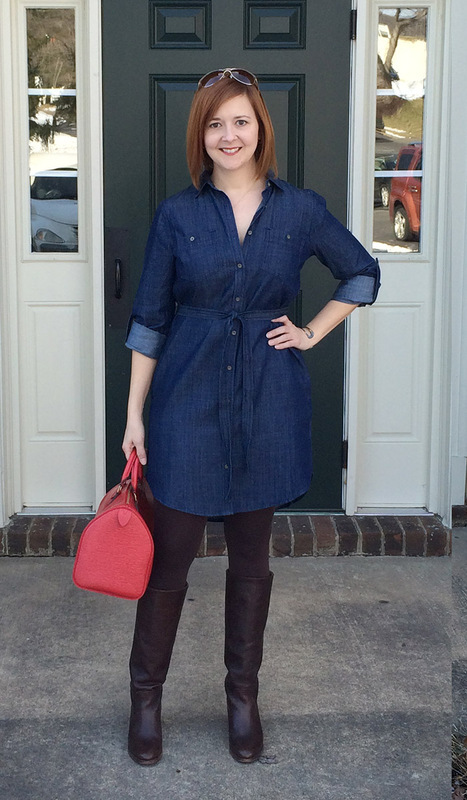 Adrien: Review: Banana Republic Chambray Shirtdress. It's not a terrible dress, it's just not doing me any favors and makes me look more high waisted than I actually am. I even tried it with a belt instead of the tie and that didn't work either. I'm not sure why the tie is sitting so high, but that's where it ended up after a lot of fussing and this is the kind of dress that should be easy. On a different body type, it totally would be. All that said, it seemed well-made and the fabric and color is fantastic. 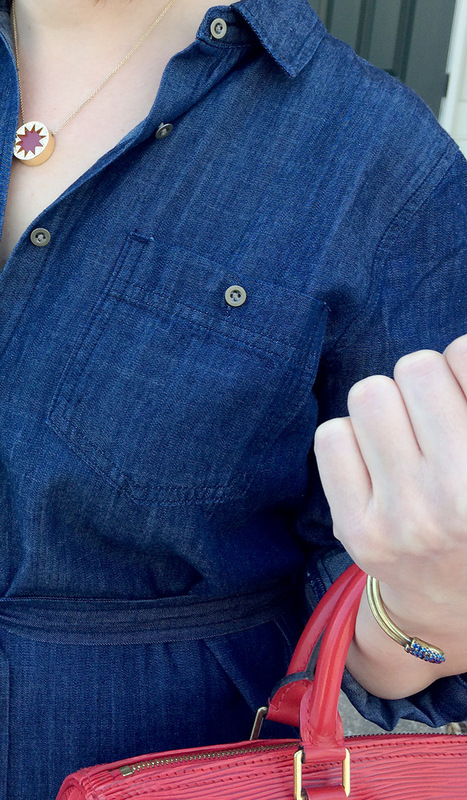 I'm not giving up on the idea of an easy denim shirt dress - Boden has one that looks very similar (but has cuter detailing) and I'm tempted to try it out for science. This one at J Jill has that art-teacher-casual-cool look that appeals. There are options! What do you think? Is it a bust or am I being too critical? MyHabit has your fav Giles & Bro jewelry on today!! Check it out! I'd agree - the waist looks like it is sitting too high. I'd pass on it. Gotta agree with Anon, I think the waist is sitting higher than it should be and if you're not sold on it, I'd let it go. I hope you are not going to be returning this after you wore it for a day. That's really rude since it can't be resold to another customer! Sorry, no! I should have explained - I wore it just for the photo, which I took last weekend. I think you look amazing in it. The color looks great with your hair color. !it does seem a bit high waisted (but not in a bad way) and if you're not sold on it, then return it. 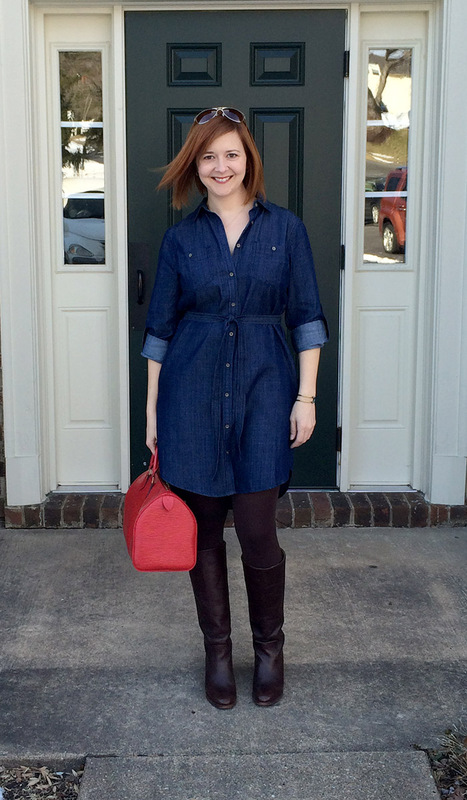 Totally not feeling that J Jill dress at all. Aw thanks, it just seemed like more work than it should be. I thought the J Jill had potential, but it would depend on how it was styled, I suppose. I like it actually, and was pretty tempted to order until you said it had pockets. Ugh. My hips do not need pockets added to them! I'm always looking for high/empire waisted dresses, finding that they are hard to come by, but they really do flatter my high-hipped self. And the back, I don't feel like it looks the best, too much fussing required with the fabric bunchiness and whatnot. Does that make sense? But from the front, I really do love it. The pockets would be easy to have removed (and worth it if you love the dress otherwise) but I just didn't love it that much and I agree, the bunchiness in the back was irritating. Pity - it looks amazing except for the slightly-too-high waist. Might be made for a straighter, rectangular figure with less bust. Annoying! You have nice, long legs - why hide them in massive boots? 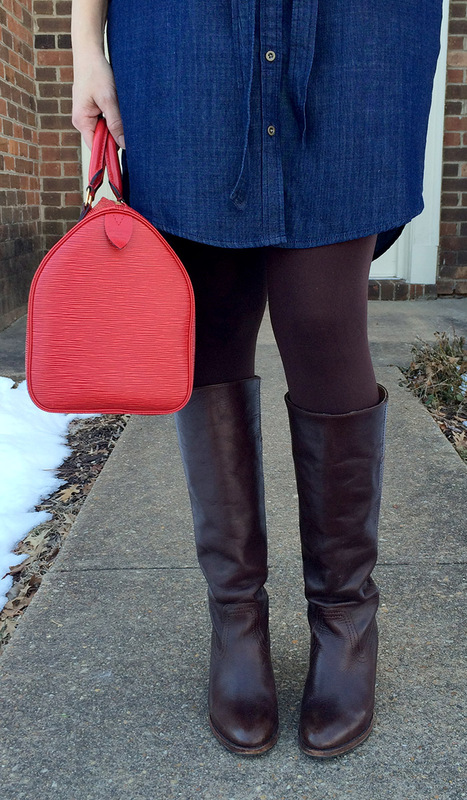 I like the dress, but the boots and the bag seem to belong to a different tale. The colour of the dress is great with your own colouring.